The vanitas still life genre, which takes its name from a passage in the biblical book of Ecclesiastes—“vanity of vanities, all is vanity”—used groupings of objects to offer a cautionary message about the foolishness of spending money and time on worldly possessions and leisure pursuits. Placed prominently in the center of the composition, the skull is a memento mori, a reminder of death. The hourglass, the guttering candle, and the soap bubbles remind us that time on earth is fleeting, and exhort the viewer to lead a righteous life. The musical instruments, the cards, and dice—and even the painter’s palette—comment on earthly distractions that all pass away. The African servant holds up a portrait miniature; its subject, most likely the person who commissioned the painting, points to the skull to emphasize this central message. Finally, while this painting was intended as a warning against wordly pleasures, it was itself a costly luxury item. This paradox between message and reality speaks to the complex consumer culture of the Dutch Golden Age—and also resonates with our own society. Three musical instruments are present in the painting: a lute, at far right, with its pear-shaped body; a recorder, lying on the table; and a cittern, whose rounded back is visible at lower left behind the hourglass. All three were popular in domestic ensemble playing and as accompaniment to singing, their inclusion hinting at the social enjoyment of music. 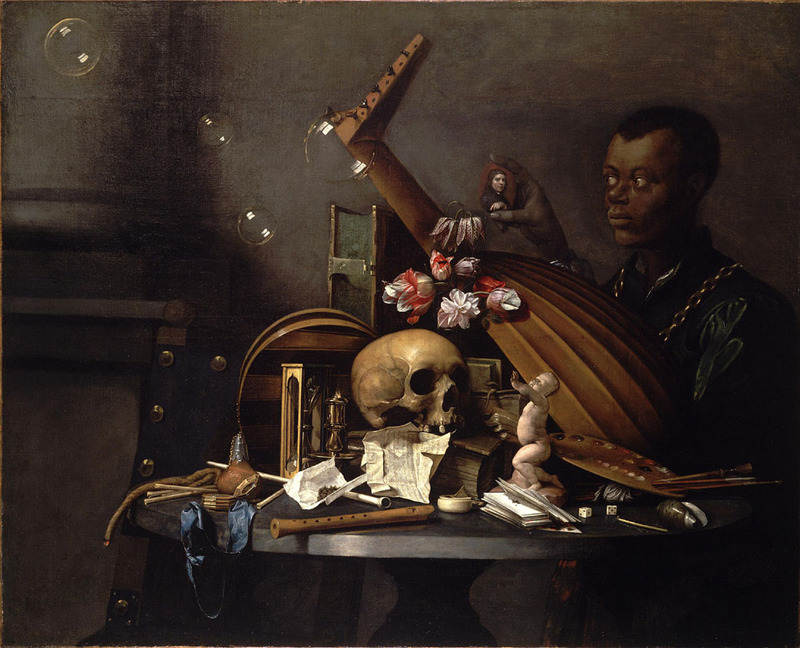 In this vanitas painting, these instruments are also included because the temporary nature of music makes a good analogy with the brevity of human life. The artist purposely turns the stringed instruments away from us to evoke death’s inevitable stilling of the voice. The flowers above the skull primarily signify the fragility of human life. The tulips also make reference to Dutch trade, first imported from Turkey in the sixteenth century. Tulips would also have reminded viewers of the Dutch craze for buying and selling tulip bulbs that caused a massive futures market crash in 1637 and ruined many investors. Finally, by including fritillaria, the checkered flowers above the tulips which often give off a pungent odor of decay, Bailly may be invoking our sense of smell to remind us of our mortality. The seashell on the table at lower right is that of the olive snail, a marine snail found throughout the Indo-Pacific. Its inclusion in the painting is intended as a warning about the vanity of shell collecting, which had become popular among wealthy Dutch citizens. As the Dutch East India Company opened new trade bases in the East Indies, new varieties of shells made their way back to Europe, feeding the desire for the acquisition of these rarities. The presence of the young African man at right is at one level a reminder that the Dutch were heavily involved in the African slave trade from the 1630s onward, transporting West Africans across the Atlantic Ocean to work on sugar plantations in Brazil. His inclusion makes clear that human beings were as commodified in the Dutch mercantile system as exotic trade goods like seashells or tulip bulbs. Paradoxically, while slavery was practiced in Dutch territories around the world, it was not allowed at home in the Netherlands. Appropriately, the gold chain around the man’s neck and his fine green doublet mark him instead as a servant in a wealthy household, and as one more trapping of worldly prosperity to be contemplated with the rest.